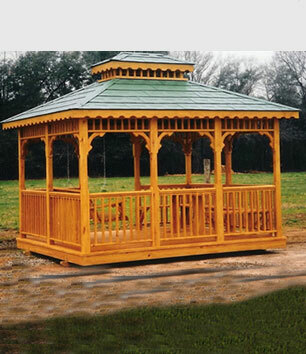 Most of us have seen a lovely gazebo and noticed that our eyes are drawn to look at it. Gazebos are not only attractive but they are so much more! They are a reminder of a time when life was less stressful and uncomplicated. Relaxing with our friends and loved ones and reflecting on good times is always enjoyable. Gazebos make that happen! Sitting and watching a beautiful sunrise or a breathtaking sunset with a cup of coffee or tea is a recuperative pleasure. Watching the stars glisten while listening to the chirping of crickets offers a natural reduction to anxiety. A gazebo invites you to enjoy that opportunity. Gazebos add value to your property. 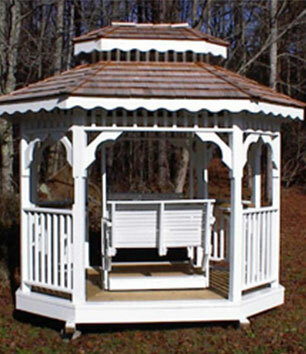 Quality crafted solid-wood gazebos provide years of maintenance-free enjoyment. These are excellent for porch, patio, garden or outdoor enjoyment. Gazebos can be painted or unpainted, with our without a cuppola and there are many other options with solid wood gazebos. 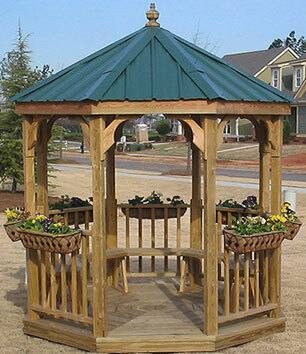 If you are looking for gazebo kits or you would like to spruce up your trellis or alcove, you have hit the right place. We offer many choices in gazebos: screened gazebos with or without a cupola, or a gazebo with a swing or a glider house with a cedar roof. 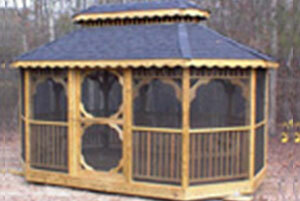 G.P.B., Inc. offers many gazebos, smoking pavilions and glider houses with screened in gazebos to choose from. Individuals and businesses may even choose to use a gazebo for a smoking pavillion / pavilion or smoking structure. Customers delight in our Mennonite handcrafted glider house or tea house. The craftsmanship of these fine cedar structures is unparalleled. 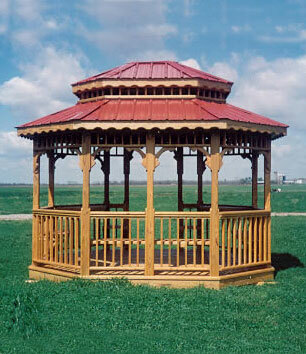 You can choose to have a gazebo built that has cedar shake shingles, a metal roof or even a gazebo with a copper roof. You may have been looking for a gazebo kit or to have a gazebo delivered; you can contact us about gazebos for more information. Thanks. Your request has been sent. We will get back to you soon. With glider and double cedar shake shingle roof. Unfortunately, by allowing our television or computers to entertain us, the skill of communication, particularly in families, has almost been lost. Without communication, we sometimes hear our children or spouse say, "You don't even know me." Swinging in a lovely gazebo, relaxing and enjoying a wonderful conversation is more than refreshing, it contributes to an environment essential for happy families. Gazebos are not just for grandparents! Having a place to discuss the happenings of the day with our children can be beneficial and pleasurable. If you find having a quiet place to sit and talk or read together is a challenge, try it in your new gazebo. And let's not forget the romantic atmosphere of a gazebo! Does sitting or swinging on a glider in the evening, holding hands sound good to you? Having nothing to do but listen to each other's thoughts is so appealing is it not? Would having scented candles, soft music, and a glass of wine help in having "a moment" where only the two of you existed? Would a hot tub for two in a gazebo add to the romance? 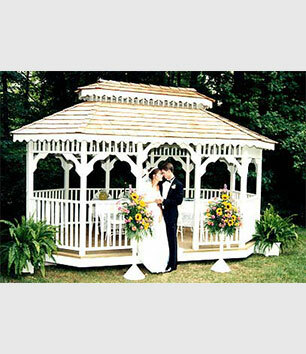 And if a wedding is in your future, nothing enhances great wedding pictures like a gazebo. We can be your gazebo headquarters. 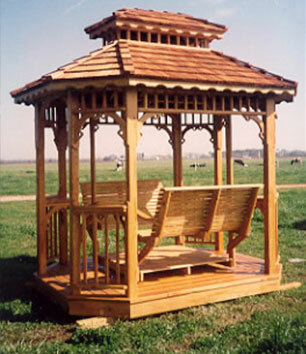 Our handcrafted solid wood gazebo will provide years of maintenance free enjoyment and add value to your property! A Gazebo from G.P.B. Inc. is excellent for porch, patio, garden or pool areas. Businesses, parks, churches, schools, restaurants, golf courses, hospitals and motels have benefited by having one of our gazebos. A nice idea for a gazebo is a shelter for children to wait for school buses, protected from the weather. Some people just need to offer an outside smoking pavilion for their customers or employees. 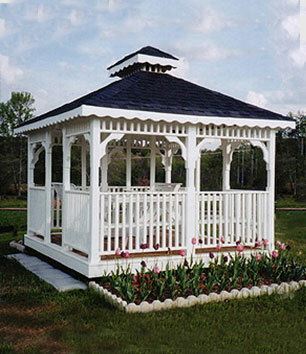 Gazebos offer classic distinction, lasting beauty and a dash of charm for your home! 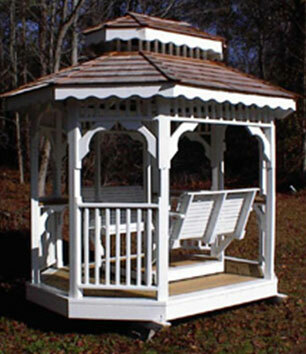 Our gazebos are built by craftsmen whose workmanship is unparalleled! 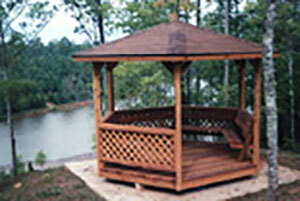 Since each gazebo is hand crafted, we are able to offer our customers many options. If you have flying insects such at moths or mosquitoes, our screened gazebo is the one of choice. Would you want a gazebo with benches or perhaps one with a swing? A gliderhouse might be for you. Customers delight in our handcrafted glider houses and tea houses. Our gazebos can be delivered to your site fully assembled or build on site. HOW THE GAZEBOS ARE MADE: All of our gazebos are built with pressure treated wood for years and years of maintenance free enjoyment. We not only offer traditional gazebos but take a moment and look at our Teahouse with its endearing double glider. Our Glider house is also a favorite! It offers a double glider and a picnic table!